Join Rossanna in a New Moon Healing Meditation Circle Celebration with music and sound for healing and transformation. A new moon symbolizes beginnings, and it is the perfect opportunity to start a new refreshing your dreams and heart desires. We will use the powerful energy of the upcoming last new moon of 2017 to take time to reflect back on your old goals and making room to new ones! We will get grounded, clear out our energy, set our intentions and express gratitude! Give yourself and your soul this great opportunity! Rossanna was born in the motherland of Shamans, in Peru. Trained in Music, sound healing and aromatherapy, Rossanna is a bilingual educator with a Master’s degree in Psychology and a professional background in counselling, and teaching. As a spiritual minister, she brings the power or art, music, language, and South American culture to her healing arts. In her circles Rossanna draws from different cultures and various spiritual traditions of the world. She also makes use of multiple therapeutic modalities including: Native American Ancestral Healing for rejuvenation, Meditation with music and vocal sounding to release stress, Sufi practices with veil dancing and sacred movements for energy shifting, singing bowls with toning and mantra chanting for chakra cleansing, as well as breathing exercises to improve circulation and to tap deep spiritual states. She is currently the Meditation Wellness facilitator in residence at the Northern Manhattan Improvement Corporation, where for the past few years she has been leading meditation circles with music, sound and movement, in Spanish, for the women at their Domestic Violence Program. A transformational movement practice, dance your daemons away! Dance Your Daemons is a transformational movement practice where we invite the hidden parts of self to be revealed, so that we can see step into their perspective. During the practice we move in ways we’re not accustomed to, with a focus on letting go of frustrations and accumulated blocks in body, mind and emotions. This will reveal patterns of how we may think and feel, in a similar way that yoga uses asana to assist us in facing our embodied energetic blocks. No prior dance experience is required. There is no need to worry about how you'll look dancing, because in this practice we wear blindfolds (or keep our eyes closed) to ignite our imagination and maintain anonymity, while remaining in the support of a shared group intention. Tara’s studies in women’s spirituality and alternative healing, led her to the profound and often misunderstood shamanic practice of bellydance. For over 7 years, she performed and lived in venues in India, Thailand and Malaysia as a bellydance artist, while also diving into meditation and other spiritual teachings. She has over 20 years of experience with emotional release work and has participated in and facilitated numerous healing events for individuals and groups. We all carry past experiences within us, both good and bad. These are carried all the way through our ancestors to those we’ve shared our lives with. Much of ourselves, including our inner voice, leads us through the life but can also be a reason we are stuck in our path. Yogi Bhajan, master of Kundalini Yoga said that we are affected by & in turn we affect 7 generations back and 7 generations forward! Just imagine the profound difference we can make to all the future generations by healing our Ancestral Karma. You can change this life by releasing past. Join Gosia Gian Preet Kaur for powerful Kundalini Yoga healing practice to release past and the karma of our ancestors and immerse yourself in a healing sound of gong. *No prior yoga or meditation experience is necessary. All levels are welcome as options and variations will be given to beginners and advanced practitioners. The inverted postures of yoga are some of the most beneficial yet intimidating of the asanas. You will be introduced to and practice postures such as crow, side crow, headstand, forearm stand, handstand, and more. You will be guided through alignment, technique, proper modifications, and feel how to develop the power in your core strength. Interact and connect with yourself and others, as you pursue the joy and empowerment of dance, universal love, peace, and good health! The workshop will focus on spinal alignment, accompanied by a series of basic Afro-Caribbean movements with a vinyasa flow. The upbeat Afro music with the six primal pattern movements will allow for core workout, and encompass stretching, releasing and breathing. This process will consist of an alignment exercise, basic Afro movements across the floor, an Afro yoga based dance combination, and a cool down. Kelvin was born in the Bahamas; he has a Masters Degree in Dance Education from New York University. He is an Assistant Professor at Bronx Community College. He teaches Afro-Caribbean dance at NYU and is a teaching artist at Alvin Ailey In Arts education Program. He is Vinyasa Yoga certified from Viva Yoga and an Aerobic and Fitness Trainer through the American Aerobics Association (ISMA). Kelvin has performed at the Apollo Theater, BAM, Joyce Theater, and Symphony Space. He has taught and directed intercultural dance workshops, conferences and performances in the diverse communities of the Bahamas, Haiti, Mexico, Ecuador, Uganda, Ghana, Barbados, China and Surinam. He is particularly interested in empowering and building communities through holistic dance and fitness works both locally and internationally. Are you stressed, finding it hard to relax? Feeling any depression, anxiousness or grieving? Are you at a crossroads in your life? Give yourself and your soul a break and join Rossanna’s meditation circle with music and sound for healing and transformation. Rossanna was born in the motherland of Shamans, in Peru. Trained in Music, sound healing and aromatherapy, Rossanna is a bilingual educator with a Master’s degree in Psychology and a professional background in counselling, and teaching. As a spiritual minister, she brings the power or art, music, language, and South American culture to her healing arts. In her circles Rossanna draws from different cultures and various spiritual traditions of the world. She also makes use of multiple therapeutic modalities including: Native American Ancestral Healing for rejuvenation, Meditation with music and vocal sounding to release stress, Sufi practices with veil dancing and sacred movements for energy shifting, singing bowls with toning and mantra chanting for chakra cleansing, as well as breathing exercises to improve circulation and to tap deep spiritual states. She is currently the Meditation Wellness facilitator in residence at the Northern Manhattan Improvement Corporation, where for the past few years she has been leading meditation circles with music, sound and movement, in Spanish, for the women at their Domestic Violence Program. Her seasoned experience leading meditation circles workshops and spiritual retreats has brought her to the Harlem Wellness Center, SAGE, and SUNY College among other organizations and private institutions. An opportunity to interact and to be cognitive of others, as you pursue your individual personal practice to universal love, peace, and good health! Through a series of basic Afro-Caribbean movements combined with a vinyassa flow (encompassing stretching, releasing and breathing), this Workshop will focus on spinal alignment exercises and the major muscles associated with the six primal patterns. Kelvin was born in the Bahamas, he has a Masters Degree in Dance Education from New York University. He is an Assistant Professor at Bronx Community College. He teaches Afro-Caribbean dance at NYU and is a teaching artist at Alvin Ailey In Arts education Program. He is Vinyassa Yoga certified from Viva Yoga and an Aerobic and Fitness Trainer through the American Aerobics Association (ISMA). Kelvin has performed at the Apollo Theater, BAM, Joyce Theater, and Symphony Space. He was a featured dancer for the band Arrested Development at Madison Square Garden, and has performed in Samson and Delilah at the Metropolitan House. 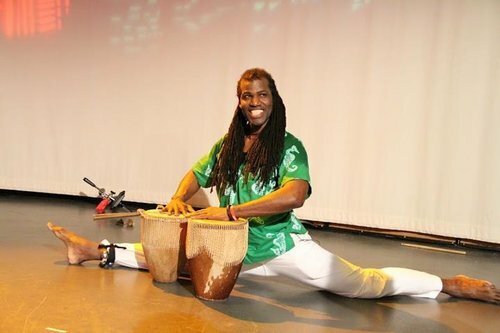 He has taught and directed intercultural dance workshops, conferences and performances in the diverse communities of the Bahamas, Haiti, Mexico, Ecuador, Uganda, Ghana, Barbados, China and Surinam. He is particularly interested in empowering and building communities through holistic dance and fitness works both locally and internationally. Kundalini Yoga, called by practitioners "the yoga of awareness", aims to cultivate the creative spiritual potential of a human to uphold values, speak truth, and focus on the compassion and consciousness needed to serve and heal others. In her workshop, Gosia Gianpreet Kaur will guide you to enrich your yoga practice and life with abundance and prosperity. With gong meditation, chanting, breathing exercises, singing, meditation, and physical sequences called kriyas, you will focus on rejuvenating your natural light. No prior yoga or meditation experience is necessary. All levels are welcome as options and variations will be given to beginners and advanced practitioners. 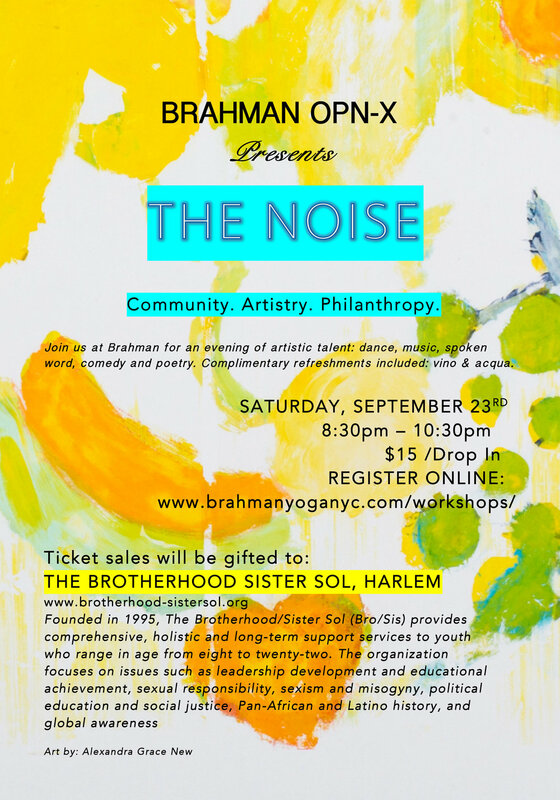 Join us at Brahman for an evening of artistic talent: dance, music, spoken word, comedy and poetry. Complimentary refreshments included: vino & acqua. Learn key yoga postures that are linked in a Vinyasa flow class. Move from a grounded and aligned place to start an energetic and mental shift. Start linking yoga postures with the rhythm of your breath. Explore breath signatures and times while in the flow. Elevate your practice to the next level. With an understanding of Vinyasa flow, start actively searching for the experience of yoga as uniting with your Self and all the possibilities. Be free! Get absorbed in rhythmic breathing and purposeful movement merging attention and intention as a devotional yoga practice. Feel the power and spirit that yoga can bring in a practical way!